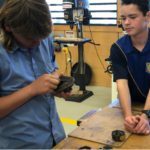 Pioneer State High School students will try their hands at trades today under the watchful eye of BHP Mitsubishi Alliance (BMA) apprentices. 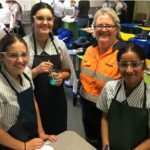 During the one-day Queensland Minerals and Energy Academy (QMEA) event, the year-10 students will learn some hand skills, and speak to the BMA apprentices about their careers to learn some tips on how to become an apprentice themselves. The hands-on morning will be followed by a tour of the Hastings Deering facility at Paget where they’ll see some of the spectacular equipment that they might work on in a trade career. BMA’s Peter Dowling said it was important to encourage young people who had an interest in trades and show them what it takes to become a trades person. “Supporting the QMEA is an ideal way to do this as the students are given year-round support and guidance to enter the career of their choice,” he said. Vincent Cosgrove from Hastings Deering said staff enjoyed the enthusiasm shown by students who visited the workshop. “Hastings Deering has been a long supporter of QMEA and we have employed a number of former QMEA school students in the business,” he said.